Synthesis and characterization of tungsten based mixed valence state nanoparticles and their novel applications are reviewed. The mixed valence state tungsten based homogeneous nanomaterials such as bronze structure MxWO3 (M = Na+, K+, Rb+, Cs+, NH4+, etc.) and tungsten sub-oxide W18O49 possess excellent infrared (IR) light shielding property, implying their great potential applications on heat ray shielding and indoor energy saving effect in summer season. Also, some novel properties such as electric conductivity, bio thermal therapy function and electrochromic properties of mixed valence state tungsten based materials are introduced. The design of components, formation of composites and structure control of thin films are expected to realize the property enhancement and candidates for practice application as window materials. The multifunctionality of the mixed valence state based composites also implies great potential on novel applications of various building materials. Tungsten is one of the most important resources of the rare metallic elements. Since it has the highest melting point among metals and a relatively large electric resistance, the most famous application of tungsten is the utilization as a filament of a bulb . On the other hand, due to the popularization of LEDs, the amount used in this field is decreasing. While, tungsten carbides have very high hardness and strength, so they are famous as high-grade cutting tools [2, 3]. Because of its high specific gravity and high hardness, tungsten is also used for military use, such as ammunition, bullets for anti-tank and anti-ship . Besides of its traditional applications, tungsten related materials also show many important applications on communication technology, computers, aerospace, life science, optical materials, photovoltaic materials, energy materials, catalysts, etc. . Recently, mixed valence state compounds, containing an element in more than one oxidation state, showed many novel physical-chemical properties. Mixed valence state tungsten based materials have shown their potential applications on infrared light shielding, conductive thin films, photothermal ablation therapy and multifunctional optical devices. The research and development on the novel applications of tungsten related nanomaterials have attracted the attention of researchers again. In the present review paper, the synthesis, structure, applications and characterization of tungsten based mixed valence state nanoparticles are reviewed. Tungsten has been known for several oxidation states, such as tungsten(III) oxide (W2O3), tungsten(IV) dioxide (WO2), tungsten(VI) trioxide (WO3), and tungsten(V) pentoxide (W2O5) etc. Besides above mentioned various valence states of tungsten oxides, it is known that the mixed valence state tungsten based compounds contain tungsten in more than one oxidation state. These non-stoichiometric tungsten based suboxides show unique structure, novel physical-chemical properties and result in many potential applications in advanced electronic devices, environmental purification, energy saving, comfortable living space and even disease treatment. There are a series of these unusual intermediate sub-oxides such as W20O58, W24O70, and W18O49, which are traditionally formed from reacting metal and trioxide. Another series of tungsten based mixed valence state materials are the tungsten bronze structure materials, MxWO3, where M represents the alkali metal elements, such as K, Na, Cs, Rb, proton or ammonium. Suboxides are a class of oxides wherein the electropositive element is in excess relative to the “normal” oxides . Several suboxides with sub-stoichiometric structures of WOx (x = 2.625–2.92) such as W32O84, W3O8, W18O49, W17O47, W5O14, W20O58, W25O73, known as Magnéli phases were reported . Figure 1 shows the crystalline structure of the series of tungsten substoichiometric structures. The W32O84 and W3O8 possess the orthorhombic phase, while the W18O49, W17O47, W20O58, and W25O73 possess the monoclinic structure, and the W5O14 possesses the tetragonal structure. The W18O49 contains both octahedral and pentagonal bipyramidal coordination of the metal atoms by oxygen . Unit cells of all Magnéli phases of various tungsten sub-oxides. a–g Crystal structures of W32O84, W3O8, W18O49, W17O47, W5O14, W20O58 and W25O73. Over the past years, nanostructured tungsten sub-oxides have been studied because of their unusual defect structures and distinctive physical and chemical properties. Several methods have been utilized to synthesize tungsten suboxides with various nanostructures and morphologies. Recently, solvothermal synthesis has also become an effective way to synthesize tungsten suboxides with different morphologies. Not only spherical morphology, but also nanowires with a large aspect ratio, or some unique unusual morphologies such as tree-like and nanotube structures, which were also successfully synthesized . Figure 2 shows some presentative morphologies of W18O49 synthesized by solvothermal method (Fig. 2a–h) [9, 10] and infrared heating W foils under vacuum conditions (Fig. 2i–j) [11, 12]. A newly developed water controlled-release solvothermal process (WCRSP) was also applied to synthesize W18O49 with controllable diameters of the spherical shape . 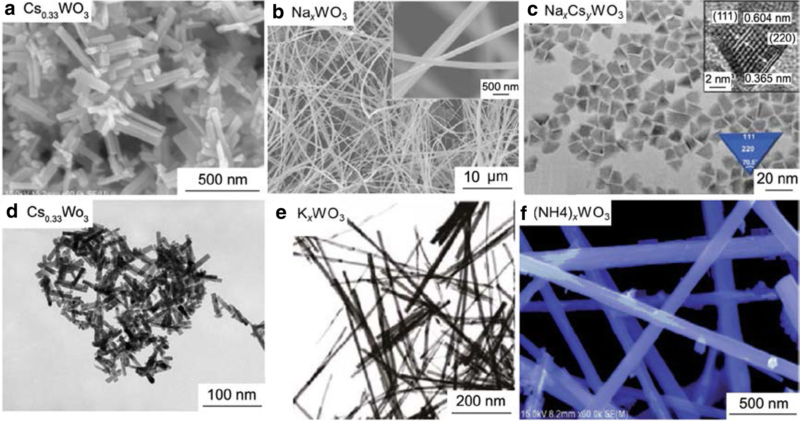 It was reported that the growth of one-dimensional W18O49 nanotubes and nanowires could be carried out by annealing WCx films followed by oxidation treatment . Also, the colloidal W18O49 nanorods were also successfully synthesized by the pyrolysis of W(CO)6 at high temperatures with the presence of Me3NO·2H2O and oleylamine . Various morphologies expose different facets, resulting in changeable surface energy, and are expected to show some novel properties. 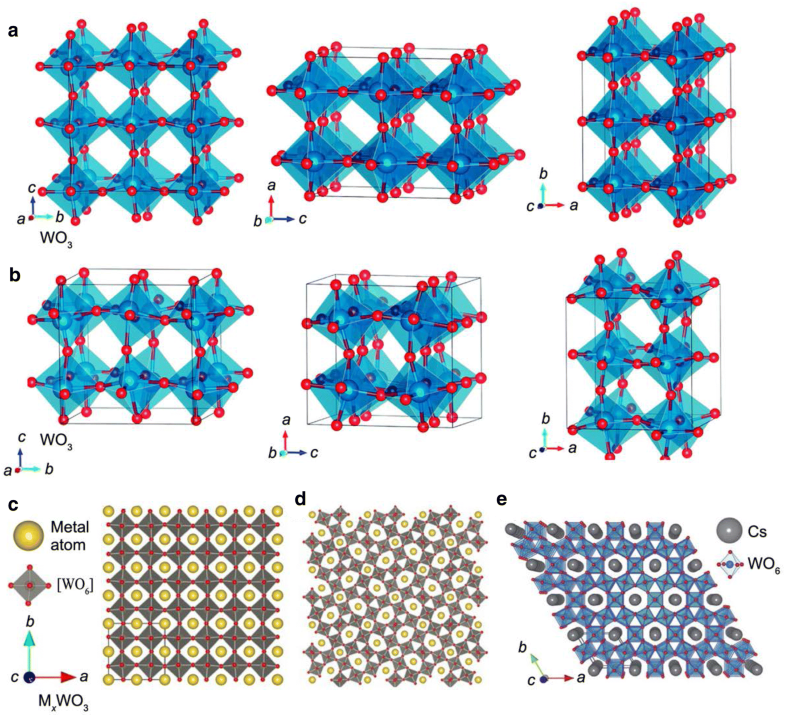 Morphological control of W18O49 sub-oxide by a–h the solvothermal method [9, 10] or i, j infrared heating W foils under vacuum conditions [11, 12]. Tungsten bronzes are non-stoichiometric compounds with mixed valence state also. They show a general formula of MxWO3(0 < x < 1), where M consists of alkali or alkaline earth metal elements. It was also reported that proton and NH4+ might be used for the tungsten structure materials. Tungsten trioxide (WO3) is an insulator, consists of W6+ ion without valence electrons . On the other hand, the bronze structure, consisting of the mixture of W6+ and W5+, possesses large amounts of free electrons, which lead to novel physical and chemical properties [13, 17, 18, 19, 20]. Figure 3 shows the crystal structure of tungsten trioxide (WO3) and tungsten bronze (MxWO3) with various x values corresponding to hexagonal, cubic and tetragonal phase structures. The tungsten trioxide possesses the single valence state of W6+. The crystal structure of tungsten trioxide is temperature dependent. It shows tetragonal structure above 740 °C, orthorhombic structure between 330 and 740 °C, monoclinic structure from 17 to 330 °C, and triclinic structure from − 50 to 17 °C. The most common structure is monoclinic. Crystal structures of tungsten trioxide with a orthorhombic  , b monoclinic  and tungsten bronze (MxWO3) with c cubic (x = 1), d tetragonal (1 > x > 0.33) structures  and e hexagonal (x < 0.33) . 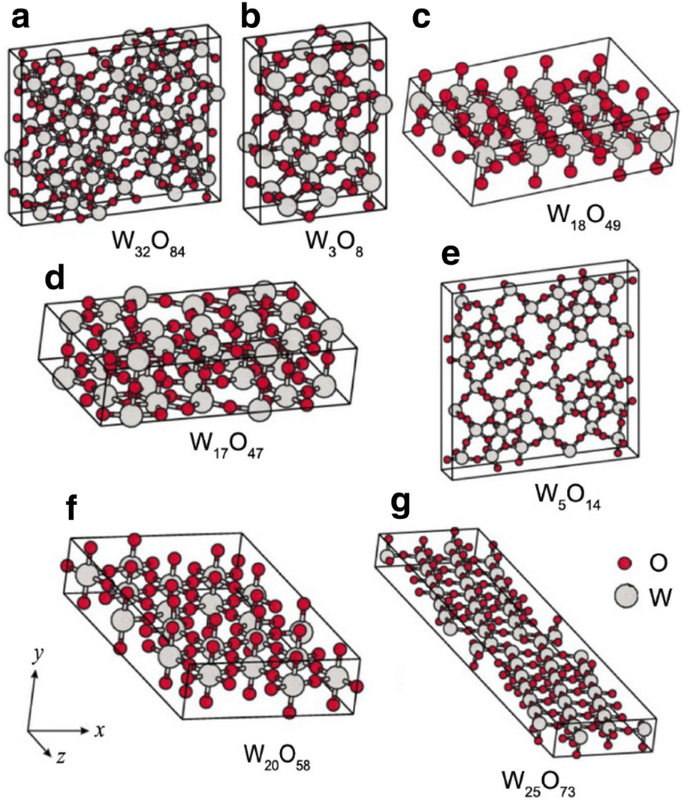 The (100) surface of WO3 has the lowest density of atoms in the unit cells of both monoclinic and orthorhombic phase of WO3 . It is known that the reaction activity of tungsten oxide changes with their preparation methods and temperatures. The low-temperature synthesized WO3 is physically-chemically active with a high surface area and even soluble in water, while the high-temperature synthesized one is difficult to be dissolved in solvents. On the other hand, the tungsten bronze structure material MxWO3 possesses mixed valence state of tungsten (W5+ and W6+) [13, 18, 19]. Their crystal structure changes with their different x values. In the case of the large size ion, such as Cs+ ions (ionic radius, r = 0.167 nm), in principle, only the maximum value of x = 0.33 of Cs+ ions can be introduced into the hexagonal structure (Fig. 3e) [22, 23]. With the decrement of the ionic radii, if some smaller ions such as Li+(0.076 nm), Na+(0.102 nm), K+(0.138 nm), Rb+(0.152 nm) are utilized to instead of bigger ions of Cs+, the distortion of the MxWO3 crystal will occur. As a result, the shrinkage of the tunnel structure occurs and leads to the formation of tetragonal (Fig. 3d) and cubic (Fig. 3c) structures [17, 22, 23]. The tungsten bronze structure can be described as an open framework. The cation occupancy in the bronze structure determines the electric property, because of the quite different mobility of the cations affected by their channel sizes of the bronze structure [24, 25, 26, 27, 28, 29]. Because of the existence of large amounts of free-electrons in the mixed state bronze structure, the plasma effort can be expected, and result in some special optical and electronic properties. Also the plasma effort on different dimensions of the materials, especially in the case of two-dimensional tungsten bronze particles, is expected to induce unique optical properties of those materials. where n is the free electron density and m is the electronic mass. Different compositions of tungsten bronzes result in different free electron densities, while different particle sizes and morphologies also lead to the change of plasma frequency related to their corresponding dimensions . where Dp is the particle size, πDp is the circumference of a particle, λ is the wavelength of incident radiation light, and S is the scattering intensity of light. Based on the value of α, these domains are classified as different scattering regions. In the case of Geometric scattering region (α ≫ 1), the particles are much larger than the wavelength of light (Dp ≫ λ), and the scattering is in inverse proportion to the particle size. With the particle size increasing, the scattering decreases slowly. If the particle size decreases to Mie scattering region (α ≈ 1), the scattering becomes the greatest when Dp = λ/2. While in the case of Rayleigh scattering region (α ≪ 1) with smaller particles, the scattering is in proportion to the particle size to the sixth power. In other words, the decrement of particle sizes results in great decreasing of scattering, leads to a higher transparency . From the above viewpoint, the dimensional and morphological control of tungsten bronze materials are also interesting and important. The nanosize of particle prefers to realize a high transparency, while the 2-dimensional morphologies are expected to realize different infrared light shielding properties with controllable light wavelengths. They are important for the design and synthesis of novel optical thin film materials. As shown in Fig. 4, until now, various efforts have been carried to successfully synthesize different morphologies of tungsten bronze materials MxWO3 (W = Cs, Na, K, NH4) [23, 26, 27, 28, 32]. Morphological control of tungsten bronze materials MxWO3. a, d Cs0.33WO3 [23, 32], b NaxWO3 , c NaxCsyWO3 , e KxWO3  and f (NH4)xWO3 . Mixed valence state compounds possess non-stoichiometric structure. The tungsten sub-oxides and tungsten bronze structure materials consist of the tungsten with W6+ and W5+ valence states. The W5+ gets an electron, and then transforms to W6+; While W6+ losses an electron, and then transforms to W5+. This free electron vibration between W5+ and W6+ contributes to many novel physical and chemical properties such as conductivity [9, 26] and specific wavelength light absorption, resulting in many novel applications such as ultraviolet (UV) or infrared (IR) light shielding, transparent conductive oxide thin films, smart windows and bio-applications. It is known that both ultraviolet (UV) and infrared (IR) radiation are potentially dangerous and exposure is common in many working and living places. UV and IR radiation are parts of the electromagnetic spectrum. The electromagnetic spectrum ranges from gamma rays at the high energy to short wavelengths at the low energy. The middle of this energy spectrum belongs to visible light, which ranges ~400–700 nm and can be identified by human’s eyes. The UV and IR radiation are invisible and exposure is not detectable, although UV irradiation is harmful to our eyes and skin, because of its high radiation energy. IR radiation is electromagnetic radiation with longer wavelengths than those of visible light, and therefore is generally invisible to the human eye. Most of the thermal radiation emitted by objects near room temperature is infrared. Infrared radiation is widely used in industrial, scientific, military and medical applications. Infrared radiation can be used as a heating source and shows many applications such as to remove ice from the wings of aircrafts , cooking and heating food, curing of coatings, forming of plastics, annealing, and drying . On the other hand, about more than half of the total energy from the Sun was found to arrive on earth in the form of infrared. The balance between absorption and emission of infrared radiation has a critical effect on Earth’s climate. Of course, IR radiation also results in some demerits in human’s life. In summer season, large amounts of IR light component in the solar spectra results in a very large thermal effect, which is the main reason for the temperature increment inside of housing environment. This directly results in the high-power/long time running of air conditioners in summer, and of course larger electric power consuming. Tungsten sub-oxides and tungsten based bronze materials can be excellent candidates for the applications of UV and IR shielding. Figure 5 shows the transmittance spectra of tungsten oxide/sub-oxide and various components of tungsten bronze based materials. Tungsten trioxide (WO3) possesses a wide band gap of 2.62 eV and was transparent in visible and NIR lights range. Although UV light shielding property related to its bandgap structure was observed, no any IR light shielding property of WO3 could be realized. Because tungsten element in the WO3 possesses only single valence state of W6+, no free electrons existing in their components. On the other hand, in the case of sub-oxide phase W18O49 and bronze phase MxWO3, not only bandgap related UV light shielding, but also free electrons/mixed valence state related excellent IR shielding properties can be observed. As shown in Fig. 5, various components and different morphology or particle sizes resulted in different IR shielding wavelengths. Although the controllable wavelength range was still limited, it was obvious that plasma frequency was contributed by the electron density and their corresponding dimensions, agreeing with the discussion related to the Eq. (1). Also, based on the discussion of the Eqs. (4, 5), the scattering of fine particles in Mie scattering region and Rayleigh scattering region, decreases greatly with the decrement of particle sizes, resulting in high transparency in the visible light region. For the IR shielding applications, indium doped tin oxide (ITO), antimony-doped tin oxide (ATO) and lanthanum boride (LaB6) are well-known commercial materials which are widely utilized . However, the ITO and ATO show limited IR absorption ability in short IR wavelength region, while the LaB6 shows insufficient absorption in the long IR wavelength region. Figure 6 shows the transmittance and reflectance profiles of CsxWO3 compared with those commercial ITO glasses with different conductivities. It was obvious that the CsxWO3 had a superior performance over commercial ITO glass in both UV and short wavelength region of IR light . Also it was confirmed that the IR shielding property of the thin film synthesized by the squeegee method using slurry of fine particles was caused by the absorption of the tungsten bronze particles (blue dash line in Fig. 6). While the shielding properties of commercial ITO glasses were caused by the reflectance (red and green dash lines in Fig. 6), which strongly related to their high density structures by the physical sputtering method . These results indicate that the mixed valence state tungsten based materials show premier properties even than those of ITO, which consist of rare metallic element Indium (In), implying their potential applications as smart windows. As shown in the thermographic images of the powder and thin film species under IR light irradiation, the obvious temperature increment was successfully observed, indicating their potential applications as novel biomaterials such as photothermal ablation therapy (PTA). Those applications will be introduced in the next section. Transmittance spectra of CsxWO3 nanorods, commercial ITO glass (5 Ω/sq.) and commercial ITO glass (10 Ω/sq.). The dash lines show corresponding reflectance spectra. The background shows the relative energy wavelength distribution of solar spectrum on the sea level. Inset presents the enlarge area of UV light region and the thermographic images of after IR light irradiation . Similar to that of tungsten bronze structure materials, tungsten sub-oxide W18O49 also shows the excellent IR shielding properties. The tungsten sub-oxide with various particle sizes were successfully synthesized by precisely controlling the solvent composition during a so-called “Water molecular Controlled-Release Solvothermal Process (WCRSP [23, 36, 37]), in which the water molecular amount in the reaction solvent system might be precisely controlled, and resulted in the effective particle size control of the final W18O49 products. Also, it is interesting that the IR shielding property increases with the decrement of W18O49 particle sizes (Fig. 7) . It is suggested that the IR shielding property strongly relates to the polaron transfer by hopping between two neighboring nonequivalent tungsten sites on the surface of nanosize particles, and the palaron effect becomes stronger with the particle size becoming smaller. a–f Relationship between IR the shielding property and the particle size of W18O49, synthesized by WCRSP process. (a 1100 nm, b 300 nm, c 80 nm, d 100 × 10 nm, e 60 × 10 nm); g Schematic illustration of the simulated experiment and h the time dependence of the temperature of the sealed boxes covered by quartz glass, W18O49 coated quartz glass, and ITO glass under the irradiation by a 50 W halogen lamp . The most famous transparent conductive oxide (TCO) is ITO. It is widely utilized in various electronic devices such as liquid-crystal displays, OLEDs, touchscreens and large area photovoltaic solar modules. Indium, one of the rare metallic resources, is normally taken out as a byproduct of refining such as Zn. Its reserves are about 1/1000 or less of Sn and about 1/100,000 of Zn . The indium shows the rapid growth and demands in recent electronic industry products, in which it is normally utilized as ITO sputter targets for the transparent electrode formation. From the view point of the saving of rare metallic indium resources, the tungsten based material is also one of the good candidates, because of the existence of large amounts of free electrons as mentioned above. Table 1 shows the resistance of some pressed tablets of various tungsten based compounds. Usually, the resistance of a thin film fabricated by the sputtering method is much smaller than that of a pressed tablet. In the case of the ITO tablet, it was reported that the ITO thin film showed the resistance of 2 × 10−4 Ω cm , while the pressed tablet possesses the value of 0.08–0.7 Ω cm . It is obvious that the tungsten bronze structure with the composition of Na0.61WO3 or K0.58WO3 possess excellent conductivity, even better than that of the ITO tablet, after heat treating in reductive gas atmosphere consisted of 5 vol.% of hydrogen or ammonium, indicating their great potential as the applications for transparent conductive oxide (TCO), to replace the future utilization of indium element . Normally the IR light shielding property is accompanied with a good conductivity, because the same roles of free electrons. Thermal therapy is a novel technique for bio therapy. It is known that electromagnetic (EM) energy and ultrasonic waves have been used as heating sources. In particular, advances in EM technology have made it possible for thermotherapy applications such as oncology, physiotherapy, ophthalmology, and other medicine areas. The key processes in thermal therapy normally include two techniques. One is namely hyperthermia, including long-term low-temperature hyperthermia (40–41 °C, 6–72 h) and moderate-temperature hyperthermia (42–45 °C, 15–60 min). Another is namely thermal ablation (TA) or high-temperature hyperthermia (> 50 °C, > 4–6 min) [40, 41]. The combinations of other modalities such as radiotherapy or chemotherapy with hyperthermia as a new treatment strategy are also focused. As one of the heating sources for the thermal therapy, infrared light irradiation is an ideal heating method, because infrared light is a familiar light used for the remote control of TV and the sugar content measurement of fruits. When infrared radiation is emitted from the light source, it is divided into three energies of reflection, absorption, and transmission in the object to be heated. Among them, the energy resonantly absorbed in the object to be heated induces the vibration of the molecule, and heat is generated from the friction between the vibrated substances. It penetrates the human body to some extent deeply, but it is totally harmless. The photothermal ablation (PTA) therapy using the NIR light source can penetrate into deep tissues and possesses high selectivity for ablation of cancer cells since its therapeutic effect only occurs at the tumor site with light-absorbance. So far, various kinds of NIR absorbers including gold nanorods, nano-spheres, nano-shells, and gold nano-cages, or some advanced carbon nanomaterials such as graphene oxide, carbon nano-dots have been exploited for cancer cells in PTA therapy [42, 43, 44, 45, 46, 47]. Among all the reported nanomaterials, gold nanocrystals are most extensively investigated because of their excellent biocompatibility and tunable light absorption edges. The optical absorption band of gold nanoparticles can be controlled in the region of 500–880 nm by using the particles with different shapes, sizes or aspect ratios. Recently, homogeneous and heterogeneous tungsten based mixed valence state nanoparticles are proposed as a novel and effective light-absorbent for photothermal [48, 49, 50, 51] and PTA [51, 52, 53, 54, 55]. As mentioned in Fig. 6, the thermographic images of the tungsten based powders and thin films indicate obvious temperature increment under IR light irradiation. There is an evidence for the obvious light-temperature conversion effect. The tungsten based nanocrystals exhibit strong NIR absorption in the range of 800–2500 nm, covering the whole wavelengths including the second NIR window band. Figure 8 shows the temperature distribution in cell culture dishes after different irradiation times for CsxWO3 nanorod-enriched and untreated phosphate buffered salt (PSB) controls, together with the UV-Vis-NIR absorption spectra and temperature-irradiation time dependence of the suspensions containing varied amounts of CsxWO3. Under the 200 mW laser irradiation, the PSB solution containing Cs0.33WO3 nanoparticles reached to larger temperature increment compared with that of PBS control. By controlling the IR irradiation distance and irradiation time, it is easy to reach the low- or moderate-temperature range for the hyperthermia therapy . a Digital infrared thermal camera images and b temperature distribution in cell culture dishes after different irradiation times for CsxWO3 nanorod-enriched and untreated controls; c UV-Vis-NIR absorption spectra and d temperature-irradiation time elevation of sets of suspensions containing varied amounts of CsxWO3-PEGS nanorods; (Control: Phosphate buffered salts (PBS); power of 980 nm IR laser: 200 mW, energy density: 0.7 W cm2). Normally, the nanosize particles with a homogeneous morphology, mono-size distribution and a hydrophilic property are important for being introduced into cancer cells. The colloid of PEGylated CsxWO3 nanorods were found being hydrophilic and stable at room temperature, suggesting its potential for the PTA applications. Also, from the optical response of CsxWO3-PEGS dispersed in water, it could be found that the pure water was transparent in the range of 400–900 nm and showed slight absorption at 980 nm and 1200 nm. With the increment of CsxWO3-PEGS contents from 0.25 to 1 mg L−1, the IR light absorbance increased obviously, indicating the high IR absorb efficiency of the tungsten based CsxWO3 nanomaterials. Certainly, the IR light induced temperature increase also confirmed its effectivity compared with that of phosphate buffered salt (PSB) control. The temperature of the CsxWO3-PEGS slurry solution showed a rapid increment under the laser irradiation even within such a short time as several minutes. Also, the higher concentration of the tungsten nanoparticles resulted in quicker and higher temperature increment. The temperature increment (ΔT) rapidly reached to such a large value as ΔT = 40 °C after 4 min laser irradiation, which was much larger than that of PBS control (ΔT = 8 °C), indicating the excellent photothermal heating effect of CsxWO3-PEGS nanorods. The temperature increment of PBS under IR irradiation was related to water absorption of 980 nm NIR light . 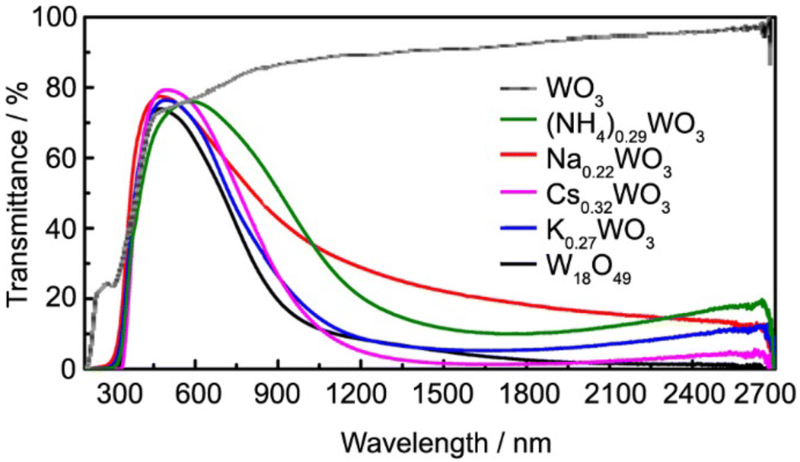 In order to depress the temperature increment effect of water itself, the utilization of IR light with the second NIR window wavelength of 1100 nm should be a good choice, because water molecular does not show any absorbance, while the Cs0.33WO3 shows excellent IR absorbance. Some reports also confirmed its effectivity under 1064 nm IR light irradiation [52, 54]. 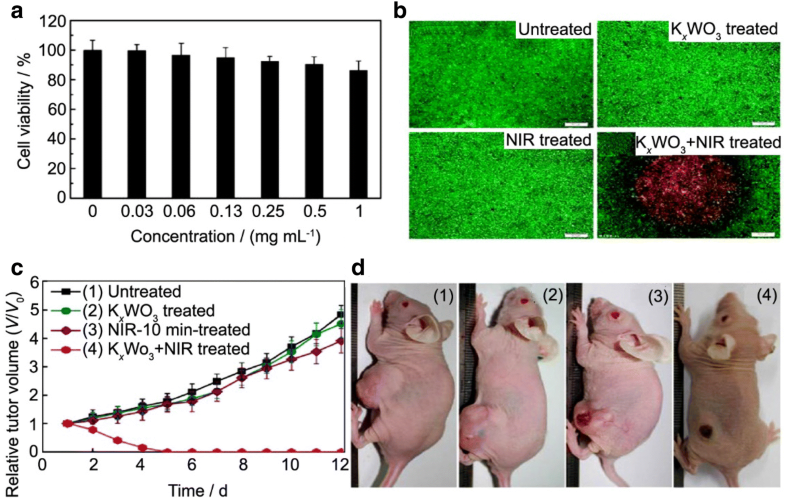 It was reported that KxWO3 nanorods might work as a phototherapeutic agent, which could eliminate the solid tumor from the mice under the second IR window irradiation. 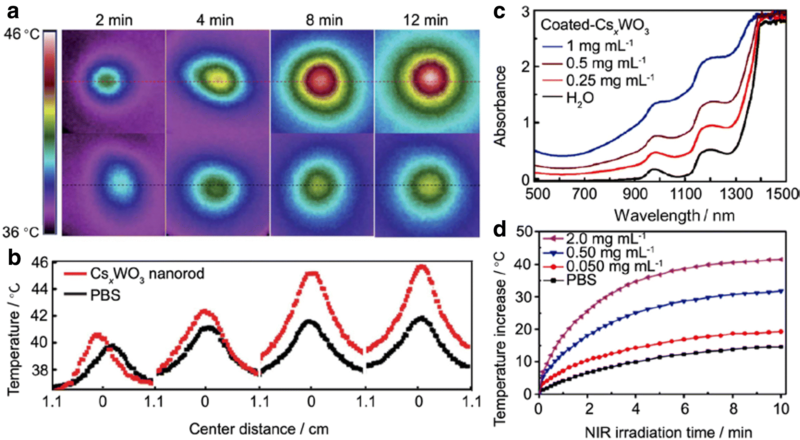 KxWO3 nanorods exhibited excellent photothermal conversion effect upon NIR 1064 nm laser excitation. The rapid, distinct and recyclable photothermal effects for both KxWO3 powder and aqueous dispersion were confirmed. Further, KxWO3 was finally proved to be an eligible phototherapeutic agent for antitumor treatment and succeed in in vitro cancer cell killing and in vivo elimination of solid tumor in living mice, manifesting a potential application prospect of KxWO3 nanorods as a kind of photothermal material. Figure 9a shows the cell viability after incubation with various concentrations of KxWO3, and the fluorescence images of HeLa cells, tumor volume size, representative CCD images of mice’s tumor after different treatments. The biocompatibility of KxWO3 nanorods can be checked by a MTT method, which is a colorimetric assay for assessing cell metabolic activity to determine the HeLa cell viability after incubation with a phototherapeutic agent. It was obvious that even after incubation with such high concentration of KxWO3 as 1 mg mL−1, nearly 90% of the cell viability could be kept after 24 h, indicating the excellent biocompatibility and very limited cytotoxicity of KxWO3. The in vitro photothermal treatment using Calcein AM and propidium iodide staining was carried out to visualize living (green fluorescence) and dead cells (red fluorescence) respectively. The result obviously confirmed that, in the cases of cells without any treatment/cells with KxWO3 additive/cells irradiated by near-IR light, only a bright green color fluorescence could be observed, indicating the existence of living cells only. While in the case of cells together with the KxWO3 nanoparticles, the irradiation of near IR resulted in obvious red fluorescence, indicating the cancer cell deaths by a remarkable phototherapy effect. Also, similar to the in vitro results, the tumor kept growing in the case of KxWO3 itself or near-IR alone without therapeutic outcome. While for mice received KxWO3 injection together with 1064 nm IR light irradiation, the tumor size decreased remarkably. It might be concluded that KxWO3-mediated photothermal treatment under NIR irradiation might provide a great contribution to the photothermal therapy for cancer therapy . a Cell viability after incubation with KxWO3 at different concentrations; b Fluorescence images of HeLa cells after different treatments; c Tumor volume of mice after different treatments (five mice in each group); d Representative photographs of mice at 14th day after different treatments . Electrochromism is the phenomenon of reversibly changing color stimulated by redox reactions. Various kinds of materials and structures can be utilized for the electrochromic devices. Normally the color changing of electrochromic materials are based on the control of electric potential. 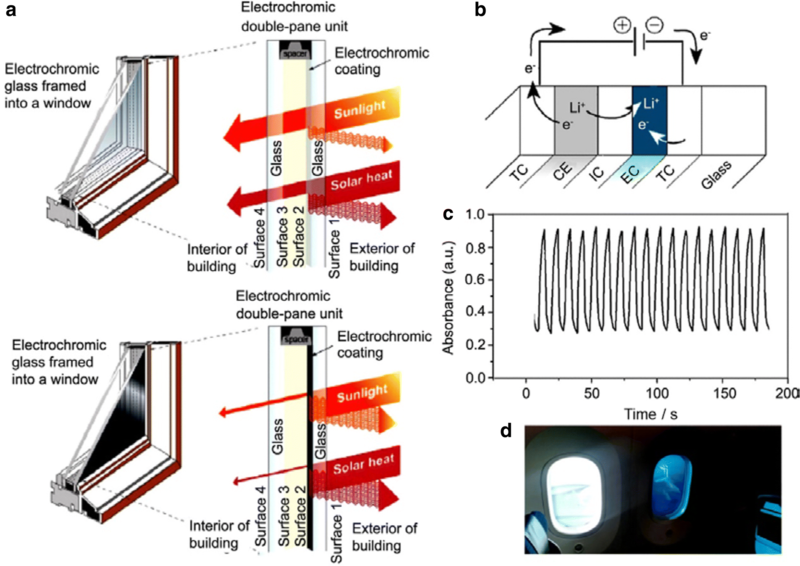 Electrochromic smart window has the ability to absorb light under the action of electric field, and selectively absorb or reflect external heat radiation and internal heat diffusion, reducing residential buildings to keep cool in summer and warm in winter, which can avoid a lot of energies being consumed for the temperature control of human’s living spaces. Electrochromic smart window also serves the purpose of preventing a peek, and solves the problem of modern urban light pollution. Electrochromic materials have bi-stable properties, and electrochromic displays not only require no backlight, but also display static images without consuming electric power. The automatic anti-glare rearview mirror made of electrochromic material can adjust the intensity of the reflected light according to the intensity of the external light through the electronic induction system to achieve the anti-glare effect and make driving safer. The electrochromic smart glass can adjust the light intensity at a lower voltage (2–5 V) and lower power, resulting in the energy saving effect and making the human’s living space more comfortable [55, 56, 57, 58, 59]. Among the metal oxides, tungsten trioxide and its sub-stoichiometric compounds are utilized as the active layers in electrochromic devices. The processes of ions insertion and W6+ reduction result in a dramatic color change from transparent/yellow to dark blue . The selection of good insertion cations is a key point for the improvement of coloration, bleaching times, and coloration efficiency. Typically, H+ and Li+ ions are used for charge balance due to their large diffusion coefficients. Figure 10 shows the configuration, principle, working images and electrochromic performances of the devices. A typical configuration for electrochromic (EC) window applications consists of five thin film layers on a single glass substrate or sandwiched between two glass substrates (Fig. 10a, b). For inorganic electrochromic window devices, the cathodic electrode is typically tungsten based materials, and NiO is a typical anode material. The electrodes are separated by a solid state electrolyte with a good ion conductivity. The EC window becomes dark when small ions such as H+ or Li+ and associated electrons transfer from the counter electrode (CE) to the electrochromic electrode (EC) layer. While, reversing the voltage polarity causes the ions and associated electrons to return back to their original CE layer, as a result, the glass returns to a clear state. Normally the electrochromic reaction can be controlled by a low voltage DC power supply less than 5 V to switch the glazing. Sputtering thin films are often utilized for the large area electrochromic devices. Of course, the clear state of the EC glazing has an excellent visible light transmission and passes the solar energy. When a direct current (DC) voltage is applied on the films, the darkened thin film effectively shields out large amounts of solar energy [55, 56]. a Configuration , b principle  c repeated stability of electrochromic property using molybdenum-doped hexagonal tungsten bronze  and d working images of electrochromic window devices of Boeing 787. (TC-transparent conductor, CE-counter electrode, IC-ion conductor, EC-electrochromic layer). It was reported that the molybdenum doped hexagonal tungsten bronze (Mox-HTB) possessed the excellent electrochromic property. The Mox-HTB could display color changing from bleach, light blue and dark blue with high-contrast, suitable response speed, high coloration efficiency and low operation voltage. As shown in the Fig. 10c, the changing of the absorbance of the film is performed with excellent repeatability and stability, showing the great potential of the tungsten based materials [23, 57, 58, 59]. Currently, electrochromic window is also used in some high-end cars and aircrafts such as Boeing 787 (Fig. 10d). The synthesis, structure and applications of mixed valence state tungsten based materials are reviewed. 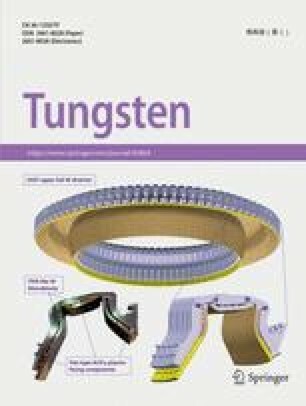 Besides of their traditional applications, tungsten related materials also show unique physical-chemical properties and have many novel applications such as UV shielding or infrared light shielding, conductive thin films, photothermal ablation therapy etc. Also the composites combining with the tungsten related compounds show the great potential as multifunctional optical devices. The designs of film structures are expected to effectively control the functionality of the smart windows. As an example, the photocatalysis functionality is another hot topic of the applications of tungsten based materials. The composites thin films with designed structures and components consisted of tungsten compounds and photocatalysts might result to some novel multifunctionality (Fig. 11). 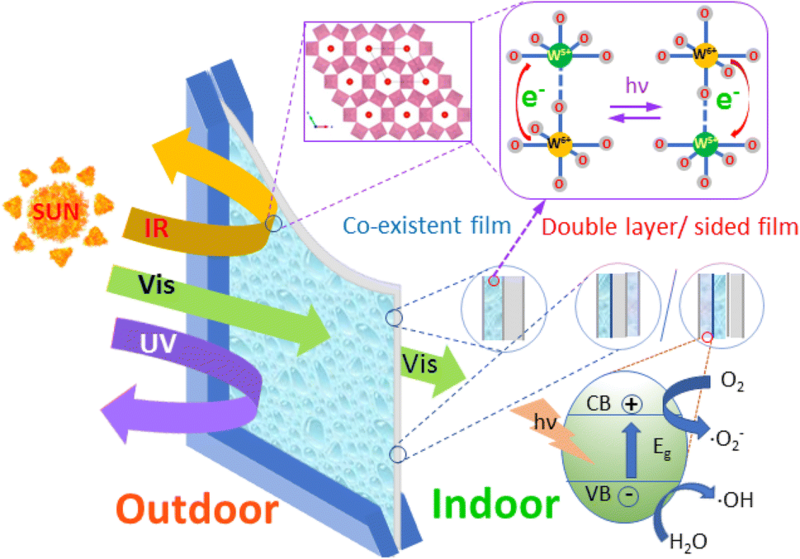 Not only UV/IR shielding properties, but also environment purification and self-cleaning functions can be expected, indicating their great potential as novel housing materials. The design of composition and film structure are expected to effectively improve the functionality of the smart windows. Until now, many kinds of composite type multifunctional materials such as W-C co-opted TiO2 , CsxWO3/ZnO [62, 63], F-TiO2/KxWO3 (FT-KWO) , P25/(NH4)xWO3  and g-C3N4/CsxWO3  have been successfully synthesized. The nanocomposites exhibit a synergistic effect on photocatalytic environmental purification ability, self-cleaning property, blocking NIR and UV light as well as excellent visible light transparency [61, 62, 63, 64, 65, 66], etc. The research, development and strategy on the novel applications of tungsten related mixed valence state nanomaterials have attracted great attention of researchers again. This research was partly supported by Japan Society for the Promotion of Science KAKENHI (Grant Number JP16H06439, Grant-in-Aid for Scientific Research on Innovative Areas), the Dynamic Alliance for Open Innovations Bridging Human, Environment and Materials, the Cooperative Research Program of Network Joint Research Center for Materials and Devices and the Hosokawa Powder Technology Foundation.